I have taken great inspiration and learning from everyone here at ExPo, so I'm delighted that over the next several months we'll finally be able to contribute back to the community and share our build-up as it progresses. crew cab - 2 kids! Which basically left the International, and the Ford F-650. International has a good dealer network, but we felt that CAT has an even broader parts/service network, and so we leaned towards the F-650 with the CAT C-7 engine and Allison 6-spd transmission. Both trucks can have the same Meritor axles, the same 2-piece wheels, the same MPT81 tyres, and similar load ratings. Finally, we hit the ULSD diesel emissions challenge, so we decided to buy a pre-emissions control 2007 or earlier truck. 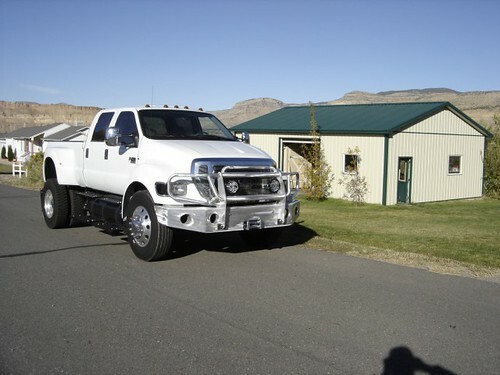 Finding a 'slightly used' one that matched all our criteria proved to be very difficult until we found a crazy F-650 pickup with 3,000 miles and a distressed owner in need of selling. We bought the truck, and will remove and sell the pick-up bed. The bull bar was just built by Layne Wright at Denver Offroad Bumpers. He did an amazing job designing and hand crafting it all out of very light weight (and recycled) aluminum. It's being powder coated black now. I'd STRONGLY recommend Layne to anyone! The truck is on its way now to Tulsa Truck Manufacturing where Ron Turner and his guys are going to do the 4x4 conversion and stretch out / reinforce the frame. Over the past couple of years we looked at dozens of possible solutions for the camper. In the end we eliminated going with an off-the-shelf camper body like Doug Hackney's (very nice) unit. Most were too small, and there were too many unique things we wanted. StarTracks - Very willing to work with our designs & based in the USA which keeps costs low compared to shipping the truck back and forth to Germany. We're still working on the details of the design and have had some great ideas & revisions so far. 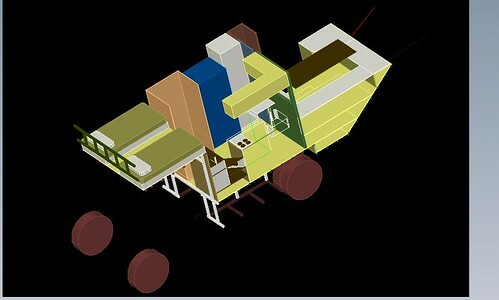 The current design looks like it will be 17ft long, plus 2 single beds for the kids above the cab. The dinette lowers to a double bed for guests, and there is a queen bed for us that lowers from ceiling above the dinette. On one hand 17ft BEHIND a crew cab feels like it's going to be a huge vehicle with a turning circle the size of a football field. On the other hand, 17ft is not a whole lot of space to plan out for full-time living space for two parents & two kids! Cabinetry - All made from Bamboo, not "wood"
Fuel - No propane on board, everything can run off the bio-diesel (or regular diesel if necessary) and/or solar / generator. Congratulations on finding a truck for your build. Looks like you've found a winner. Glad to hear Layne is still in the bumper biz. I've heard great things about his abilities with aluminum. Looking forward to following your build. Thanks. A quick question...Do you have plans to use the cab for anything other than place for you and your family to sit while on the road? We've got Alton doing the conversion work on the cab after Tulsa are finished with it. Mounting all 4 captains chairs on swivel bases so the front two can turn to face the kids in the rear, and the rear two can spin around to face to fold-down desks on the rear wall. Any other ideas for us? PS - Forgot to mention, we've still got your lock hasps on the list of items for the cab doors. We need to get those from you at some point! What is the GVW of your chassis? My guess is that fully loaded "wet", with tools, parts, food, people etc. you'll be at 25-30K lb. What tires are you going to run? My personal choice with duals would be 13R22.5 XZLs. If you are going to try to run single MPT81s I believe their largest load capacity is 152K (7100kg/15620 lb per axle), insufficient IMHO for you. You'll need 365-395/85R20 or 425-445/65R22.5 for singles in the rear. Are you going to construct the camper yourself, or have someone build the shell and finish it? Great choice of truck, I'm keen to see how it performs when its built. The CAT engine is a beast. Do XZL's have a higher load than MTP81s? Don't you run them? 335/80r20 XZL 4670 at 55psi (9340 per axle). The equivalent size MPT81 has 50% more load, albeit at a higher pressure. I don't have a set of 365 XZLs to compare to the MPT81's. I personally prefer MPT81's as they run silent and dead straight, XZL's can be hard to balance and a 200+ pound tire shakes the whole truck when it wobbles (use beads or something made a huge difference for me). XZLs have one huge advantage in that they can run with or without tubes and are good in mud where MPT81's are not so good. It's hard to pick, they are both great tires. Sticking with 22.5 inch semi type rims is a good call, you can get tires all over the world in one form or another. 20 inch tires (mog tires) can be very difficult to get. Another thought, if you do go with singles you can do a 4 wheel steering set-up. It would greatly decrease your turning radius. Addited: When I first read this I somehow assumed you were going to be building them for production. If it's just for private use, the above may be N/A. WRT other ideas, I like the Class Bs that have swivel seats that are used as the dinette, like RoadTrek did. However, with two kids I think the single table would be a pain. My kids are going to be in boosters for the next few years, so it's not practical for them to use the front seats during meals. When it comes meal time, I think it would be better if the front two swiveled to face the rear two, then have a small tables on each side. Kind of like two, two-person dinettes. That way the hallway is open so that the parents can come and go from the front seats. You could always have a fold-up section in the middle, if you wanted to, that would convert the two small tables to one wall-to-wall one. Rob, I didn't know 365/80R20 MPT81s went that high. I thought they just went to 152K. But I doubt even 17520 in the rear will be enough. My U500 absolutely maxed out ready to travel is 8100kg in the rear or 17800 lb. His camper is roughly 10% longer than mine and he has the crewcab and a half. Weight is always the biggest issue! That is one massive truck. I'm sure I will get some arrows slung at me, but can't help but see how in the world that monster is some how going to be construed as being environmentally friendly is beyond me, even given your use of mostly recycled products for the camper. There are a few of those around town here. One guy even uses it as a daily driver :smilies27 There is not a speck of dirt or scratch on it. Very dumb in my opinion, but those beasts do serve a purpose. If your on this forum I'm sure your heading in the right direction. That truck will make heads turn, have fun with it. I think it's just a matter of relativity. Compared to other vehicles of that size with those capabilities it's going to be as environmentally friendly as it can be. It's not like they could build this out of a Prius. That being said......it should be a great build. Good luck!!! Thanks for your many great comments and suggestions. This is why I love ExPo. Below are some of my responses to your intial suggestions. We are planning on creating the Eco-Roamer as an 'Open Source Expedition Vehicle' - so I'll be posting up all the components and decisions we've made over the next few months. I'll be happy to have any of your advice / suggestions. I'd be flattered to bump into another eco-roamer somewhere on the road and know that our notes were of some help to building more great vehicles.